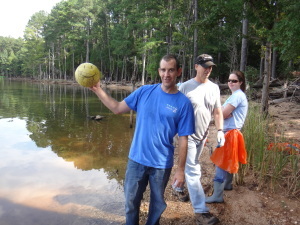 Employees from Pfizer Biotech of Sanford, Duke Energy's Shearon-Harris Nuclear Plant and Biogen Idec participated in community service days with Clean Jordan Lake over the past 4 months. This was the first time for Pfizer Biotech and Duke Energy and the fourth for Biogen Idec. Volunteers for all three community service days were assigned to stretch of Wilderness Island shown on this map. Wilderness Island is not really an island but a peninsula that borders the Haw River Arm on its east side. To reach the tip of the peninsula to do a cleanup would require walking in several miles from the end of Seaforth Rd. Instead, we ferried volunteers from a dock near Jordan Lake Dam using a flotilla of boats provided by the Army Corps of Engineers, Cross Winds Boating Center and John Flack, a Clean Jordan Lake helper. The three cleanups resulted in removal of 160 bags of trash and 14 tires. This brings our bag total to over 9,000 since 2009, enough to fill about 30 big dumpsters. Volunteers enjoyed their 10 min. ride over to Wilderness Island. It gave them a chance to appreciate the natural beauty of the lake and the graceful Great Blue Herons that are everywhere. The cleanup work itself is not easy. There are thousands of tiny pieces of Styrofoam from the break down of fast food containers. Unfortunately, wildlife ingest Styrofoam. Molly Malone, the organizer of the Duke Energy event came away with an idea to reduce Styofoam and other food packaging products in their cafeteria. Mindy Leland, the coordinator for Pfizer Biotech's effort on June 10 said afterwards that "This was a great opportunity for team building. We worked together to make a difference in our local environment. It was hard work but it was worth it!" Biogen Idea employees have a choice of projects in their " We Care Deeply" day of community service. On Sept. 19th, Biogen Idec volunteers arrived in buses for two shifts, one for the morning and the other for afternoon. The morning group was ferried to Wilderness Island while the afternoon group cleaned a section of shoreline near the departure dock. In the last four years of participation with Clean Jordan Lake, 368 employees have removed 562 bags of trash and 138 tires. Greg Runyon, one of the organizers, said "we always not only do something meaningful but we have fun doing it!" To that end, Greg awarded prizes for the strangest items of trash to be found.